I am in my second trimester of pregnancy and have gotten lots of my energy back. I still want to go to bed at 8:30, which is against my non-pregnant nature. That's why the blog has been ignored. I usually blog when Marcus and Katie are sleeping, but sometimes I beat them to the punch. I am up now due to a late nap and some caffeine. So, I still can't believe I'm pregnant! We had a sonogram last Monday and I told Marcus I was just as shocked to see a baby in there as I was when I saw a positive pregnancy test in August. And not to be a Debbie Downer, but after 2 miscarriages, I have just kind of been waiting for the third one. Creepy, huh? I am usually a "half glass full" kind of a girl, but I guess I have a little PTSD when it comes to this pregnancy thing. I just have to put my trust in God and not my past circumstances. He loves this baby more than I ever could. And lots of times I feel like I am "fake" pregnant, but my belly says I'm "real" pregnant. It's big and it's hungry about every 2-3 hours. I have consumed an extraordinary amount of cereal. Last Friday morning Katie and I had to wake up at the crack of crack! I had to do a small physical for our insurance and it was at 8:00 am in Dallas. That's the direction everyone goes to work, so it was super trafficy and we had to leave by 7:00. Katie and I struggle to get out of the house by 9:15 for school and church. 7:00 was hard. AND, AND I had to fast...for 12 hours! Marcus met us there, because he was just getting off work at the fire station that morning. 7:00 is practically the afternoon to him. 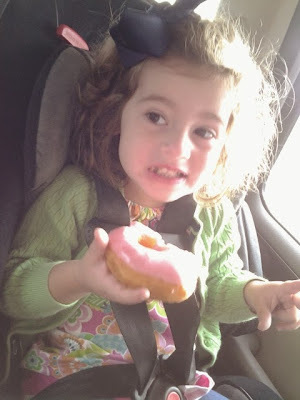 Thankfully it was Donut Friday, so we partook after my physical and things were good again! I had to take a nap by 10:30, for real! That night Marcus and I went out to celebrate our anniversary. And Katie attempted her first sleep over ever, at my sister's house. We got a call to pick her up at about 11:00! She didn't make it very long. We were fine with it, because Marcus and I had just watched a movie where a little girl died, so we were kind of ready to get our hands on our baby. Last Sunday I took Katie to big church with me. Marcus was at work, so it was just us girls. 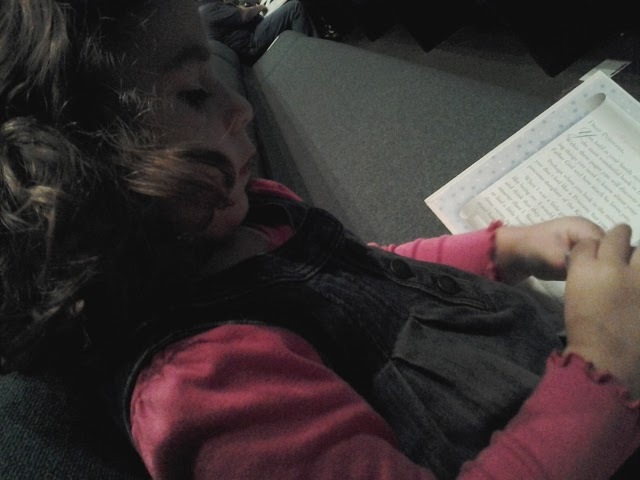 She did great and "read" here Bible most of the time. 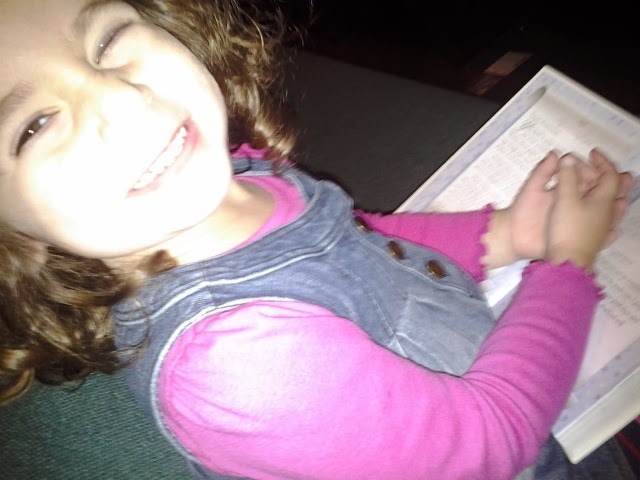 And I fed her about a million pink tic tacs. The first picture I took, I accidentally left the flash AND the sound on. So that was a little embarrassing. Hopefully I will be better about documenting our lives. I don't want to forget stuff. And something tells me that in April, when I am 39 with a newborn, the memory might be the first thing to go. And maybe the sanity too! So good to hear you're doing well. I've been praying for you everyday and will keep it up! I'm glad you updated....I'm not going to lie......when you don't update regularly, I worry.....ha, ha....I so want this pregnancy to go well for you....I'm praying. Glad to see y'all are still doing well. Having been in a very similar boat, I understand what you mean about waiting for the worst to happen with your pregnancy. Can't wait to hear more about how things are going as you move along with this one!! I'm so happy for you! I went through a late miscarriage, and after that I was so nervous about my pregnancy that I didn't announce it until I was 16 weeks and the size of a bus! I can't wait to hear what you are having and see the nursery. when is your due date? my oldest daughter is pregos too and she is due march 2nd. I'm going to be a Grandma..so exciting!! Can't wait to see what you do for nursery decorations!! I am OVER THE MOON for you guys!! It's so exciting!! Glad you have passed the first trimester and on to the second. Woohoo!